Time for some Deep Discounts! We’ve been around for exactly eight years now. On the internet, it works like dog years, which makes us 45. Some of our older games are beginning to show their age, and are not competing well with our newer games. It hurts to drop these prices, because I still love playing these, but it is the right thing to do. This entry was posted in Uncategorized on July 30, 2016 by admin. I dislike making firm promises about updates, as it’s hard to know how long certain objectives will require, or if they are even feasible. This tends to lead to stress on my part, and often disappointment on yours. So I try to keep the promises a little vague, while mostly keeping you in the picture about what I’m doing. Currently, I’m building update 1.10. This will add a fifth airport, and some bug fixes. The new airport is a float plane base located in downtown Vancouver, BC Canada. Have a look at these screenshots of my progress. View from the mountains, north of Vancouver. Being a pilot from Vancouver myself, I can tell you that this looks fairly realistic. 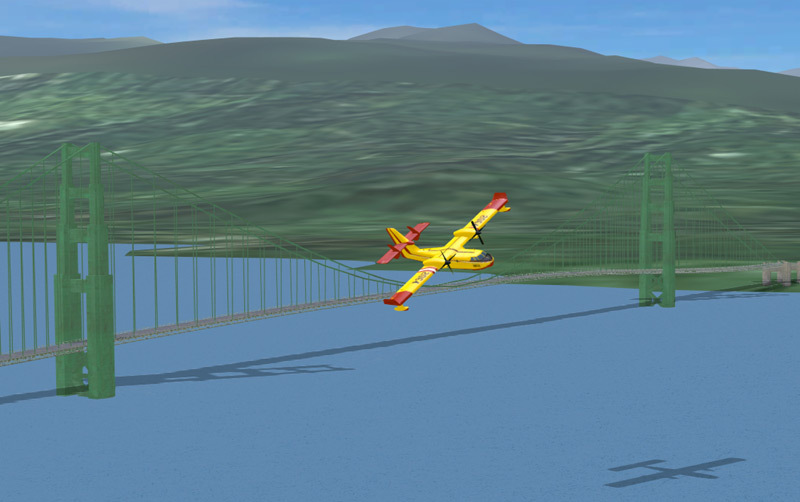 CL21 overflying the Lions Gate Bridge. These are used for forest fires, but in Airport Madness, they carry terrified passengers. The challenge with this level is that we are located at the edge of a major city, so I’ve had to add much more detail than I’m used to. Some of you may have guessed that I’m new to 3D, but I can tell you that I learn quickly. I’m hoping to offer you a level that looks better in quality compared to previous. 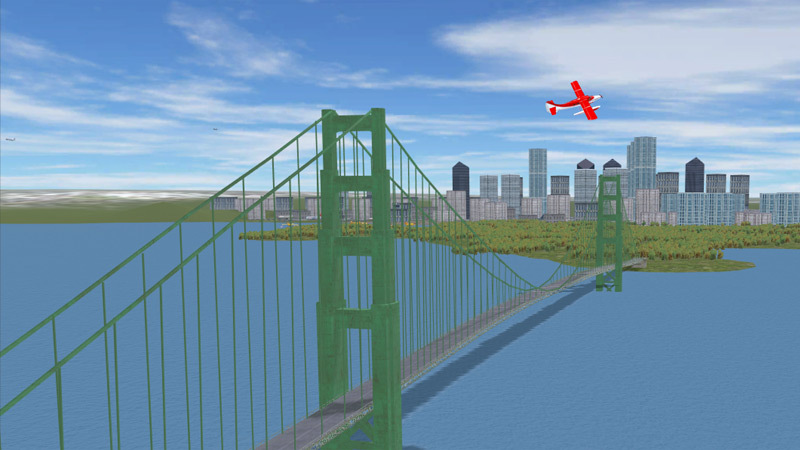 As float planes are much smaller than passenger jet aircraft, the tower is much closer than usual, and it became obvious that animated humans would be required. So I’ve added these, and they look relatively good. Hopefully we don’t run into performance issues from too many polygons. I’ve added parked vehicles, too, but have yet to decide whether these deserve animation. How far do I take it? It’s an air traffic control game, and I’m trying to decide whether I’ll get sued if I add a Starbucks on the corner. Maybe I’ll keep the city details somewhat limited, and focus on getting the game play right. I am hoping to add a traffic-unjam tool of some sort. I’d also like to figure out why airplanes roll backwards onto runways, and why there are occasional ghost explosions. Rocky Mountain terminal parking deserves a little tweaking, as it is “Traffic Jam Central” at the moment. It’s like a movie theatre on a Saturday night. Stay tuned! I’ll post details here regularly.